There have been thousands of articles and blog posts written about the PIVOT operator. PIVOT seems to get all the glory. Meanwhile, UNPIVOT doesn’t really get equal time… it’s like the poor stepchild that everyone knows is there but is ignored. In this article I’m going to give poor UNPIVOT the spotlight. We’ll take a look at how it works, and, as a result, we’ll end up discovering a new and fresh approach to unpivoting multiple sets of columns. Next time, in Part 2, I’ll go over some unpivoting examples that (gasp) might even be practical. Very simply put, the UNPIVOT operator will convert columns into rows. (Conversely, the PIVOT operator will aggregate rows into columns… and that’s all we’ll say about PIVOT for the rest of this article… it’s UNPIVOT’s time to shine). So, for each row in our original table, we have converted/expanded the Q1Sales, Q2Sales, Q3Sales, and Q4Sales columns into 1 row each, creating two new column names: Sales (which contains the value of our original columns) and Descript (which contains the name of our original columns). This is why, in this example, the Descript column is created as a NVARCHAR(128)… because 128 is the maximum length for the name of a column. You can see that UNPIVOT eliminated the NULL values automatically, which is fine in this example. UNPIVOT always does this, and there’s nothing we can do to change that behavior… but there may be cases (which I will give an example of later) where we do not want this to happen. So this was not a traditional simple LEFT JOIN, it was a correlated LEFT JOIN, which is really my old friend, the APPLY operator. I don’t really know why the Optimizer chose to use an OUTER APPLY rather than a CROSS APPLY. After all, it’s impossible for the Constant Scan to produce any empty set, so there doesn’t seem to be any reason to employ an OUTER APPLY. So the same query can be safely written using CROSS APPLY. One might argue that the UNPIVOT query takes less typing and appears much simpler, but we have so much more freedom with our output using the APPLY approach. Here I am writing a blog post about UNPIVOT, giving it some time in the spotlight, and then I end up slapping it in the face and turning my back on it and showing you a better, more flexible way to accomplish the same thing. Note that Patient Number 2 only had two tests performed… the values for his 3rd set of values are all set to NULL. And note that Patient Number 3 did not have a Glucose Test performed in his test of Dec16,2009 (because a Glucose test requires fasting, and Patient Number 3 forgot and scarfed down a half-dozen waffles for breakfast that morning). Yes, it’s true, this is a lousy way to record data, with all these columns of information, and therefore, we will unpivot that information into a nice normalized result set. This approach does a CROSS JOIN with the table and a derived table of integers (representing the column number groups) and then CASE expressions are used to output the appropriate values in the SELECT list. Either way, this CROSS JOIN approach is pretty cumbersome to maintain and is not very easy to understand at first glance. (And, pardon my political incorrectness, but it’s ugly as hell too). That expanded our table of 3 rows into 8 rows (the TestDate3 value was eliminated for Patient Number 2 because it was NULL). Do you notice a row that’s missing? What happened to our Patient Number 3’s test from Dec16,2009? It’s gone! Yep… remember that UNPIVOT has that nasty habit of eliminating NULL values. So when we UNPIVOTted the Glucose columns, Patient Number 3’s test with the NULL Glucose value got thrown out the window, and we ended up losing ALL of his Dec16,2009 data. This is, unfortunately, a side-effect of using this method. Isn’t that terrific? So simple… So clean… So compact… So elegant. I don’t think MSFT needs to introduce an UNPIVOT that handles multiple sets of data. Why bother when you have an approach as simple as this? In my next blog entry, I’ll go over some additional examples… some fun and some practical… of unpivoting data. I'm guessing they put in PIVOT/UNPIVOT because people asked for it. The implementation is mostly convenience. Should more and more people use it, they might decide to expend more effort on it and add options outside of the original request. Very nicely explained, Brad. Can't wait to see part 2. PS: I was thinking where were you for a long time and today saw your blog:) You have wonderful stuff there buddy. @Brian: I agree... I'm sure that in a future version they might add a INCLUDE NULLS option to UNPIVOT, for example. Great to hear from you! Glad you found me... Hope all is well. Perhaps they're continuing the wonderful tradition of UNION to do something DISTINCT that noone asked for. Just another reason to love unions. They did such a good job with the employee-base they went to the data-base for the sequel. I see you have been digging into the execution plan. Great post, I've learned several things from it already and as I keep studying it I'm sure I'll learn a few more. One of the things that I learned (that I've somehow never seen before) was renaming columns in an alias like you did above. I had no idea you could do that. Thanks for the feedback! I'm glad that it's been a good learning experience... that's always great to hear. What is your opinion about my solution in the previous post? Is it OK? Also be some other method like hybrid (native + traditional) and using just one UNPIVOT. The GROUPING SETS approach is clever, and it does produce the correct result. However, it ends up doing 3 SCANs of the table as opposed to just 1 SCAN with the CROSS APPLY method. 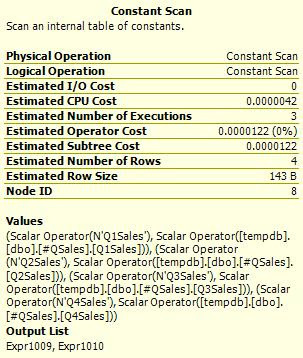 The relative costs of the estimated execution plans were 18%:82% (CROSSAPPLY:GROUPINGSETS). 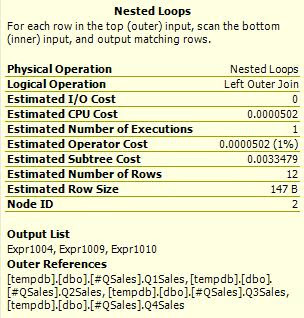 I have to investigate GROUPING SETS a little more... That's one new aspect of SQL2008 that I haven't really sunk my teeth into. Awesome , Brad.. excellent info.. As Garadin said, i learnt a LOT from this post.. Thanks sir..
arriving very late to the party, but I enjoyed this article so much I wanted to thank you anyway. im too late, but i neee to ask.. i have a big trouble with a tables... some retard guy make this table..
id year var jan feb ...... etc.